I am slowly, but surely double sleeving all the cards and putting them into the storage box, but I am still a bit unsure how I'm going to organize everything, but mostly the cards specifically. I'm thinking I want them separated by Titans/Gods/Heroes/Monsters/Troops, but also by which expansion or box they came in. I think I'm going to use some of the extra dividers to make this happen, but I'm not sure yet if it'll be possible. My thought is to have a row of "Gods" and then as you move through the row, there are further dividers for box/expansion of origin, and then repeat the process for Titans/Heroes/Troops/Monsters. Anyway - Does anyone have any suggestions of how to organize the cards (either to meet my intent, or just how your cards are organized for different ideas for me)? I organised them Titans/Divinities/Monsters(extra dividers for RP cost)/Heroes(extra dividers for RP cost)/Troops. Also, if you're double sleeving with anything thicker than 40 microns and you have a Titan/Typhon pledge, be prepared to not store every card in the DSB. this picture sorts everything basically how you want. I was concerned about this. So far I've got Core+Pandora's Box in there and I've got maybe 1.25 out of the 4 card slots left. Maybe I'll remove the special rules cards. Idk, that's slightly frustrating for my completionist, OCD mind. Can you upload the photo? It's not letting me get through that link for some reason. Why double sleeving? Are you proxying $500 Magic cards for your Mythic Battles?! Because I could potentially never be able to replace cards in this game if I mess them up. Double sleeving really only protects against massive shuffling. Like if you’re shuffling thousands and thousands of times and don’t want a card to show wear because it’s valuable. It won’t be marked if single sleeved, it’s only for underlying minor scuffing. That’s why it’s done with ultra-expensive cards. Importantly, if you get liquid on a card, every sleeve you use makes damage worse by trapping the liquid against the card. That’s why I personally wouldn’t double sleeve a boardgame (I have double-sleeved expensive Magic decks). You’re far more likely to encounter a spill than to see the difference in wear between single and double sleeving. So I find single sleeving to be the safety sweet spot. 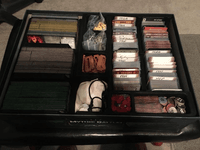 You might want to consider purchasing a game card storage case (long) to fit all your double sleeved cards and have them neartly organized, with room to separate for each category. The spare dividers I have separating the add-ons and Pandora's box activation cards. I have the art of war, omphalos, and divinity cards. Followed by the recruitment cards. I have all the expansions separate and together. My dashboards I colored the side and made a mark down certain groups based of whether it's from the core/pandora/add-one/expansions. Correct me if I’m wrong, but there are two types of cards for troops (activation and dashboard) but only one troop card divider? So far I’ve put my activation cards with the troop/hero/monster/god dividers, but I’m wondering if I’ve missed something. There are troop cards, which are the ones with a lot of information on them, then there are troop activation cards. These are the cards with just the image of the troop and the stars at the bottom. This confused me too but I just got finished organizing the box.